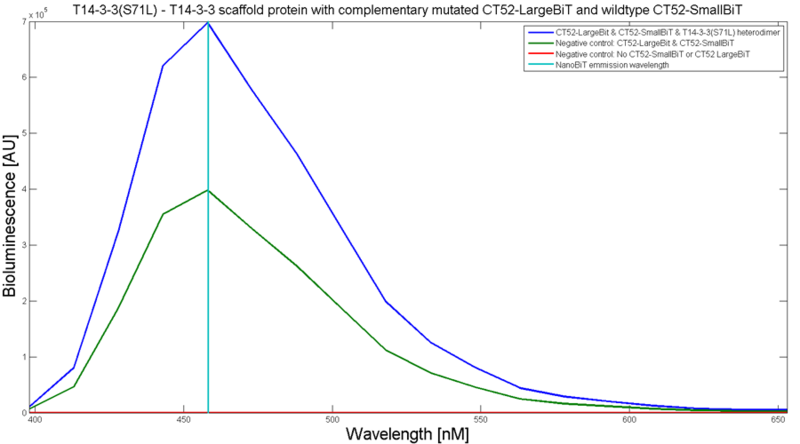 The CT52-SmallBiT BioBrick is part of a split luciferase system. This luciferase system consists of two parts, namely SmallBiT and LargeBiT. It is an ATP-independent luciferase, that produces high intensity luminescence. The total weight of LargeBiT-CT52 is 9,3 kDa. The NanoLuc system consists of 93 amino acids. When they dimerize, this means when they come into close proximity of each other, a substrate can create bioluminescence. The emission peak of this NanoBiT system is around 460 nanometers. 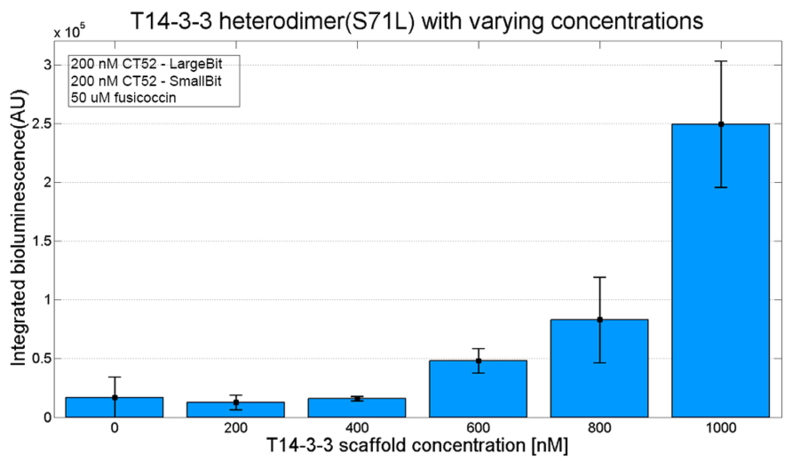 The CT52 part of this BioBrick has affinity for the T14-3-3 scaffold protein. The binding between CT52 and T14-3-3 is mediated by the small molecule fusicoccin. Together with CT52-LargeBiT "http://parts.igem.org/Part:BBa_K2065007" this BioBrick is used in testing the quality of T14-3-3 heterodimers. SmallBiT is linked to CT52 with a GGS10-linker, so it actually consists of three subparts. SmallBiT is 33 basepairs long and thus consists of 11 amino acids. The GGS10-linker that is used, consists of 30 amino acids: it is a ten-times repeated sequence of glycine-glycine-serine amino acids. This complex is linked to CT52. This protein consists of the last 52 amino acids of the C-terminal region of the H+-ATPase. The N-terminus of CT52 is a free end, which can be used to link proteins to. The binding between CT52 and T14-3-3 is stabilized by the small molecule Fusicoccin. When fusicoccin is present, the affinity of CT52 for T14-3-3 is increased in 30 fold with respect to the situation when fusicoccin is not present. The binding interaction with fusicoccin is reversibel, this means CT52 will dissociate from the scaffold. This means that the CT52-SmallBiT complex will move towards the scaffold protein, after the small molecule fusicoccin, is added. Three different variants of the CT52-protein were created with the help of the Rosetta software package. Each mutation in the CT52 protein has its complementary mutation in the T14-3-3 protein. Because these mutations were found with the help of the Rosetta software package, the quality of these mutations have to be verified. 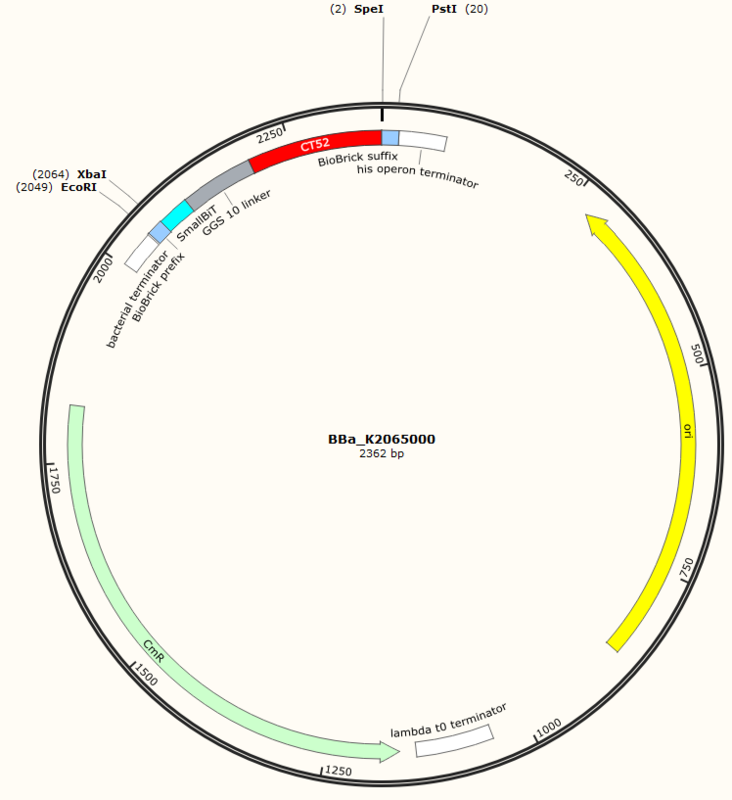 One variant of the CT52 protein was already known and tested. This mutation functioned as a positive control in the verification process of the other mutations. The sequence of our CT52-SmallBiT has been verified by StarSeq. It contains the prefix and suffix with the correct restriction sites (EcoRI, XbaI, SpeI and PstI). CT52-smallBiT is 279 basepairs long. To determine whether the split luciferase system is working, a bioluminescence signal should be visible when the two components come into close proximity of each other. A bioluminescence peak around 460nm must be visible when SmallBiT and LargeBiT dimerize. When the two NanoBiTs are into close proximity of each other, they dimerize. When Furimazine is added to the dimerized Nanoluc luciferase, the Furimazine is converted into Furimamide. When this reaction occurs, light with a wavelength of 460 nm will be emitted. The spectrum of the CT52-NanoBiT system is visualed below. 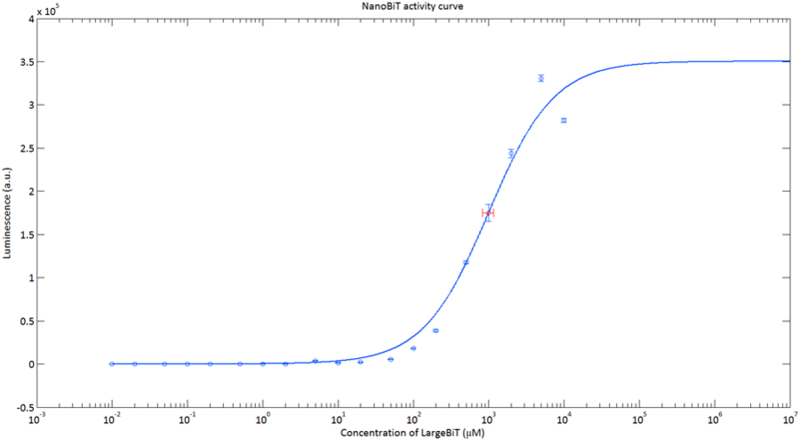 Figure 4: The luminescence of NanoBiT as a function of the concentration of LargeBiT. The concentration of SmallBiT is kept constant at 100 nM. The circles represent the measured datapoints, the errorbars represent the standard deviation of the measures (n = 2). The red circle and errorbars represent the dissociation constant and its standard deviation respectively. - Milroy, L., Brunsveld, L., & Ottmann, C. (2013). Stabilization and Inhibition of Protein–Protein Interactions: The 14-3-3 Case Study. ACS Chem. Biol., 8(1),27-35.